The hotel was clean and our room view was nice, but the hotel itself is pretty far downtown so not necessarily close to a lot of things. It was close to a subway line and close to a number of places to eat. wonderful experience and fabulous location. Several good restaurants within walking distance. One of the beat hotels I have stayed in. I loved the room in the lobby with all-day coffee. The room was small but perfect. Property had a great view of the city from the roof top bar and amazing food at the restaurant down stairs! Close to subway station and Brooklyn bridge with lots of local spots for adventuring on foot! Awesome property for the price and location! Excellent location in the heart of the Financial District! The room was ok with a good rate for the area. The mattress was kind of hard and the a/c has some operating issues, but the lobby has a coffee and snack bar included. Absolutely loved my stay here! The staff was extremely friendly and helpful and my room was very clean. It also was in a great location. I definitely recommend staying here!! Great location, near Battery Park (ferry to Statue of Liberty), World Trade Centre, Staten Island Ferry and Brooklyn Bridge. 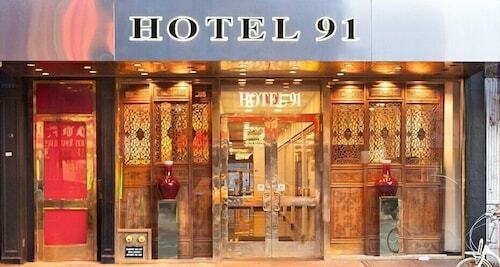 The hotel is located near great public transport and a short stroll to Brooklyn bridge and the Oculus & 9-11 memorial. China Town - close to walking to Brooklyn Bridge, subway to mid town and beyond close, bus to Battery Point close. Get the most of your visit to Brooklyn Bridge by staying in a hotel nearby. Local landmarks allow you to take in the local culture on your next holiday. There is perhaps no better way to enjoy Brooklyn Bridge than by booking a nearby Brooklyn Bridge hotel! Whether you are traveling alone, as a couple, or with your entire family, your visit to Brooklyn Bridge will be a highlight of your holiday – and your hotel should be too! Finding your dream hotel near Brooklyn Bridge is easy when you search here on Expedia.com.au. Narrow down hotels based on your budget, hotel class rating, or specific hotel themes. You can always find the best Brooklyn Bridge hotel for your needs when you book with us on Expedia.com.au.